Snooze presents “The Breakfast Experience”<br><br>What role does your character play?<br>You are the designated Snooze Aqua Technician and the Master of the Suds. You are not afraid to get your hands dirty and are the key holder to the Snooze Breakfast experience, because without plates we don’t have “perfect plates”. It all starts with you!<br><br>What will your character be responsible for bringing to the stage?<br>●	Wash dishes, glassware, flatware, pots and pans, and miscellaneous smallwares with commercial dishwasher or three compartment sink<br>●	Place clean dishes or cooking equipment in designated storage areas<br>●	Maintain kitchen work and prep areas, equipment or utensils in clean and orderly condition<br>●	May assist in preparing various foods for cooking or serving<br>●	Aid in stocking supplies, such as food or utensils, in serving stations, refrigerators, freezers, etc.<br>●	Sweep and scrub floors in kitchen and dish area<br>●	Clean garbage, compost and recycling bins<br>●	Remove and empty waste bins as needed<br>●	Transfer supplies between storage and workstations by hand or by using rolling carts<br>●	Attends all scheduled Snoozer meetings and brings suggestions for improvement<br><br>Do you fit this character role?<br>●	Fun, positive, eager and committed team member.<br>●	Restaurant experience preferred.<br>●	Must be able to communicate clearly with teammates.<br>●	Be able to reach, bend, stoop and frequently lift up to 50 pounds<br>●	Be able to work in a standing position for long periods of time (up to 10 hours)<br><br>What are the perks of playing this role?<br>●	Competitive hourly wages<br>●	Daily meal benefits<br>●	Health, dental & vision benefits for full time Snoozer after one year<br>●	Flexible work days<br>●	Breakfast and lunch hours- no late nights!<br>●	Unlimited dance parties<br>●	Super fun work environment<br><br>We can’t wait to provide you a place where the best character on stage is YOU! We are looking for dynamic people who are self-motivated, dedicated and have a strong passion for food and people! If you are a fun-loving, joke-making, out-of-the-box thinking breakfast lover that is going to bring this “Breakfast Experience” to life, we will certainly put you center stage. Are you ready for this curtain call? 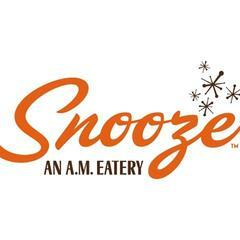 Snooze La Jolla is posting their hospitality jobs on Harri.